Three of my all time favourite herbs are most definitely herbs of love and, with Valentine’s day just around the corner, I thought it an auspicious time to share a little more about them. They are Avena, Rose and Cardamom, all famed for their aphrodisiac properties, but all quite different, though they do work in some similar ways. Avena – Oats are one of the best remedies we have for building and restoring the nervous system and this makes them a wonderful love tonic as they strengthen our reserves helping to make us more resilient and energised. Although we tend to think of aphrodisiac herbs as stimulating rather than relaxing, these kind of nerve tonic herbs act to energise us in a more roundabout way, by releasing the stresses that caused our problems in the first place and getting us strong and vital once more. So many arguments are caused by being frazzled and over-sensitive, making regular doses of Avena a great relationship soother. 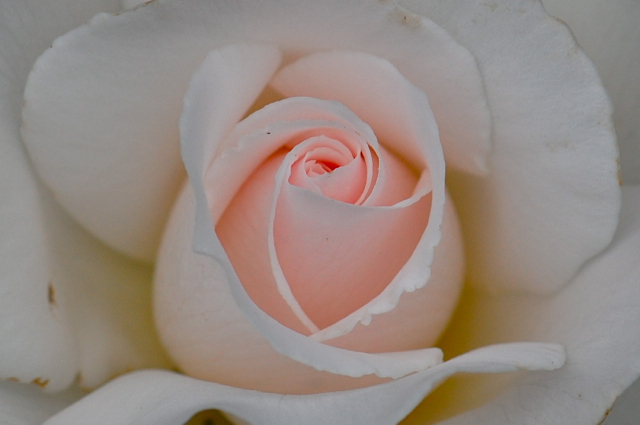 Rose – What need I say about the rose, the ultimate symbol of love? It is gently moving, gently stimulating, relaxing, aromatic and uplifting. It also opens the heart to allow greater self love and acceptance, something which enables us to partake more fully in any relationship, romantic or otherwise. 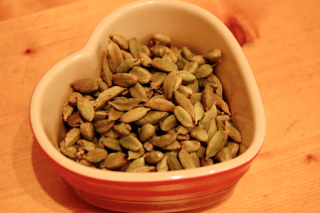 Cardamom – Cardamom is one of the most balanced of the spices and for me this makes it the true spice of love. It is both slightly stimulating, like most spices, as well as calming and centring. As I mentioned above, it is often a combination of stress and resulting fatigue that stops us from giving time and attention to our beloveds, so balancing herbs, like all those mentioned here, are exactly what the love doctor ordered. All these herbs help us to feel loved in order to feel loving. They work at the meeting point of relaxation and stimulation, of uplifting and of soothing. Essentially they work from a place of balance from which all things can flower, not just love for a partner, but love for ourselves, for the wider context of people and other sentient beings and in the knowledge that there is no real difference anyway. After all, love is just love and when it is in our hearts, all will benefit from its radiance. Here are just a few of the ways you can combine these herbs to make some deliciously delectable treats, for Valentine’s or any other day. Tea – A simple tea of cardamom (gently crushed in a pestle and mortar), rose petals and oatstraw makes a lovely soothing and heart opening blend for drinking anytime. To make an extra special tea, add some Ashwagandha root which is a traditional adaptogen and aphrodisiac of Ayurvedic medicine. To make the tea gently simmer about half a tablespoon of ashwagandha root in a pan for about 15 mins. Turn off the heat and add the other 3 herbs leaving to steep for another 15 mins before straining and serving with a little honey. Ashwagandha can be a little bitter in flavour so the addition of the honey makes it more deliciously balanced. Bath – A lovely romantic bath can be made by mixing rose petals and rolled oats with a drop or two of cardamom essential oil and tying up in a small square of muslin. Tie this around the taps as the bath is running, making sure you squeeze out all the creaminess of the oats as you go. Honey – Infuse rose petals and cardamon seeds in honey for a delicious aromatic treat. Massage Oil – Cardamom and rose are both divine as essential oils and a beautifully romantic massage oil can be made by combining them both with a base oil such as almond, olive or jojoba. To 50 ml base oil add 5 -10 drops each of rose and cardamom oils. Combining oats, rose, cardamom and other delicious ingredients into a sticky sweet treat that is sure to delight anyone you serve them to. Preheat the oven to 180C and grease a baking tray ready. Mix all the ingredients well in a mixing bowl, I find it easier to melt the coconut oil first. Transfer to the baking tray and spread evenly. Cook for about 25 minutes until golden brown then remove from the oven and score into rectangles. Allow to cool thoroughly giving the coconut plenty of time to set. 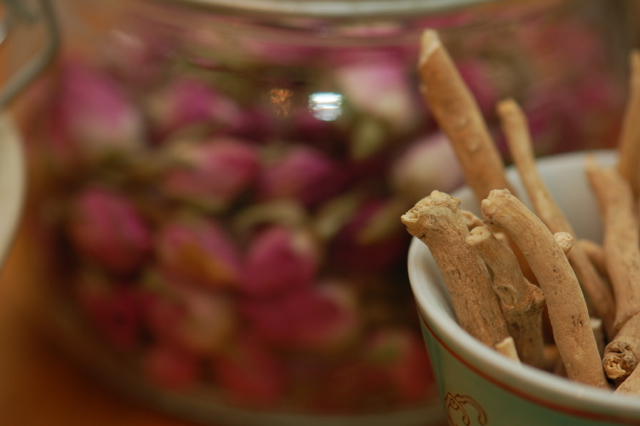 Enjoy with some cardamom, rose and avena tea and a small smile of satisfaction. Love the post! Very inspiring. I think some rose and cardamom honey is in order. Only one ingredient I would leave out: Ashwangandha. For me, ashwangandha has the exact opposite effect that it is most readily known for! An herbalist friend tells me that such a response is not uncommon for my body type (tall, slender, active). Interesting. That’s interesting, do you find it overly stimulating? It is quite a heating herb so not best for pitta type constitutions. Being an adaptogen it can have quite an energising effect but as you know, when it comes to treatment, rather than just the odd cup of tea, herbs are always best chosen with the individual constitution in mind. minor doses, I felt irritable about absolutely everything, short tempered, fidgety, anxious, and any other emotions you can think of that are along those lines. Not emotions I normally associate with, so the experience was very obvious. I told three master herbalist friends about the experience and one in particular said it was a response she would anticipate from my body type. She said that being tall was the outstanding feature she found associated with such a response. The other herbs listed in your post are absolutely wonderful for me though. Thank you for a much needed breath of inspiration to cut through my February gloom!! Yes I should have called them The Flapjacks of Luurrrve instead! I hope you are also keeping well and warm. 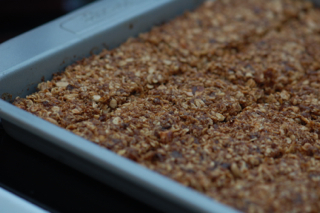 Are these the flapjacks we ate yesterday? They were DELICIOUS! I often find flapjacks a bit too dry but these ones were lovely and moist and juicy! If the Skeksis had these, they wouldn’t need to drink the living essence of other creatures! Ha ha, yes all the suffering that could have been saved if only the skeksis had flapjacks of love! Perhaps they could somehow be worked into the sequel? What a wonderful post! You know, I’ve always really loved cardamom, just everything about it, but have hardly ever seen it in things or written about.. so good to find out more about it. Now for the idiot questions (!) .. want to try the infused honey you suggest… I only have a very small amount of dried rose petals (about a tablespoon, maybe a bit more) so roughly how much cardamom would you suggest so as not to overpower them? And do I heat gently to infuse? You shouldn’t need to heat the honey, in fact honey is often best unheated as it can destroy many of its beneficial constituents. You will need to use a fairly runny honey though just to enable you to pour it over the herbs and mix well. If it’s quite firm you can heat it very gently to soften but make sure it doesn’t get too hot. If you only have a tablespoon of rose petals just do a small jar as otherwise the flavour will be lost. Add about a teaspoon of cardamom pods, lightly crushed in a pestle and mortar. Keep it on the side for two or three weeks stirring occasionally with a chopstick. Keep tasting little bits until it seems ready. You can always add a few more rose petals later if you want a stronger flavour.